After a long period of historically low inflation, it’s reasonable to expect eventually it will rise again. To find out more about inflation and what it means to investors, Money Talk turned to Landaas & Company Associate Adam Baley. Why do we care about inflation? We care about inflation because it weaves its way through everything financial in our lives. From the cost of food, the yield on money market mutual funds, the interest rate on mortgages, the price of stocks. Even our paychecks are influenced by inflation. We can thank Milton Friedman, one of history’s most influential economists, for providing the short answer: “too much money chasing too few goods.” There is, however, more going on behind the scenes. To understand what causes prices to rise, we need to understand inflation’s contributing parties. Money supply, money velocity, capacity utilization, employment and productivity are some of the factors that shape inflation. Money supply – primarily currency in circulation as well as deposits in savings and checking accounts – can drive prices and inflation up. But the money has to be “chasing” something. Money needs to be changing hands or as Irving Fischer, a purveyor of modern economics would say, it must have “velocity.” The rate at which money changes hands, chasing after goods and services largely influences the level of inflation. Consider an auction. Increasing the number of bidders tends to increase an item’s selling price. If you are the seller, you might even want to offer more for sale as prices are bid higher. Similarly, in the broader economy, adding more consumers increases the number of people who want to buy food, cars or washing machines. Producers, in turn, are willing to fill more orders as prices rise. To meet demand, companies fire up idle production lines and hire more workers (adding more consumers to the economy). If producers ramp up production to a point where they can’t keep up with orders, that too can add to inflation, as inefficiencies in the production process – such as bottlenecks and overcapacity and overtime pay – add up. How does inflation affect us as consumers? Inflation is when we go to the store and pay $150 for the same groceries that cost $100 last week. But think of who’s on the other side of that transaction – the grocery store, the growers and processors and packagers and distributors of the groceries we’re buying. Higher prices can lead to higher profits. As consumers, we can do very little to insulate ourselves from inflation but, as investors, we can benefit from rising prices. How does inflation affect us as investors? There are only two things that drive stock prices in the long term; interest rates and corporate profits. A mild and healthy inflationary environment can lead to higher corporate profits because companies – such as those involved in the groceries we buy – can charge more for their goods and services. For this reason, equities’ long-term performance has outpaced any other investment class. Part of the role stocks play in a broadly diversified portfolio is to guard against inflation in the long run and helping our investments maintain their spending power even as prices go up. But as government policymakers get worried that inflation is getting out to high, they’re expected to tighten money supply by pushing interest rates higher, which conventional wisdom suggests is bad for fixed-income investments. Indeed, rising rates are bad for bonds, but not right away. In the early innings of rate increases, the financial markets say, “Finally, the government is doing something about inflation so inflation won’t be a problem.” Bonds may actually rally a bit at first. Usually, it’s not until the later stages of rate increases that bonds tend to sell off. With higher inflation may come higher interest rates. While an increasing rate environment puts pressure on prices of bonds issued during periods of lower rates, it offers increasingly higher yields to investors seeking income. A rising rate environment elevates the yields on everything from money markets to corporate bonds. As consumers, there is little you can do. But, as investors, you can stand to benefit from higher stock prices and increased bond yields. As investors, having a prudent exposure to equities can help guard against inflation. Companies have an innate ability to be profitable when times are good and the economy is expanding. Being a stockholder – directly or through a mutual fund – you can share in a company’s profitability, either through share price appreciation or regular dividends. When it comes to bonds, inflation forces us to pay more attention to the details, like maturity. As the economy expands, interest rates rise to steady the rate of growth. Rising interest rates hit long-maturity bonds the hardest as they are the most sensitive to inflation. Shortening bond maturities can lessen the hit to the value of your bond portfolio. In rising-rate environments, it’s often best to utilize bond mutual funds over individual bond ladders. This is because bond mutual funds have daily inflows of cash (from new investors and maturing bonds) and can go out into the market to purchase new, higher-yielding bonds. It’s for this reason why bond mutual funds tend to outperform individual bond ladders when rates are rising. When we think of deflation, we think of how it affects us as consumers but not as investors. As consumers, we see deflation at the gas pump when we pay $25 for the same amount of gas that cost $40 the week before. While paying less for the same goods and services benefits us as consumers, as investors, it can be troublesome. Lower prices can lead to lower corporate profits. A deflationary environment can make even the healthiest of companies struggle to be profitable. Deflation is considered good for bonds because bonds issued under higher rates are worth more than bonds issued under lower rates. However, investors often forget to ask if the bond issuer can afford to pay its obligations in a significantly less profitable setting. A deflationary environment can be a boon for higher-rate bonds of high-quality companies. However, less credit- worthy companies, with little access to new loans, may struggle to pay back their existing debt. 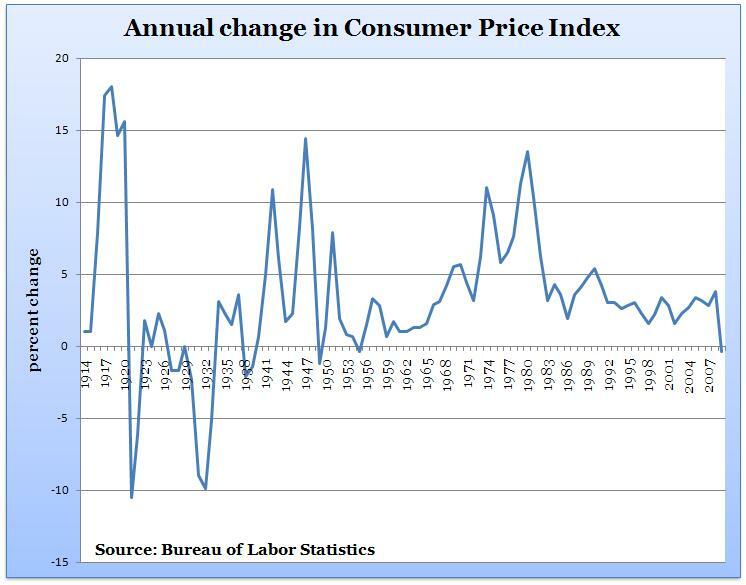 According to data from the Bureau of Labor Statistics, since 1913, the United States has had 12 years in which prices overall fell from the year before. On average, that’s one year of deflation for every eight years of inflation. While that suggests we have an economic climate history of long summers and short winters, it’s often the harsh downturns that cause investors to make kneejerk reactions that shape their portfolio for years to come. Adam Baley is an investment advisor, registered representative and a registered paraplanner who has been with Landaas & Company since 2001.